Over the two weeks of 28 February through 11 March 2010, Harinder Singh, Chief Programming Officer of the Sikh Research Institute (SikhRI), toured various parts of India as part of SikhRI’s global awareness initiative. He presented before diverse audiences on assorted topics, ranging from Sikh-specific issues to his experiences and advice for effectively running non-government organizations. According to Surender Pal Singh, a Research Associate at SikhRI and the organization’s India-Coordinator, the purpose of the speaking tour was primarily to connect like-minded individuals and find avenues to leverage each other’s strength for the collective good. 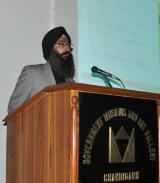 On 28 February, Harinder Singh spoke to an audience of 300 at the India Islamic Cultural Center, New Delhi. 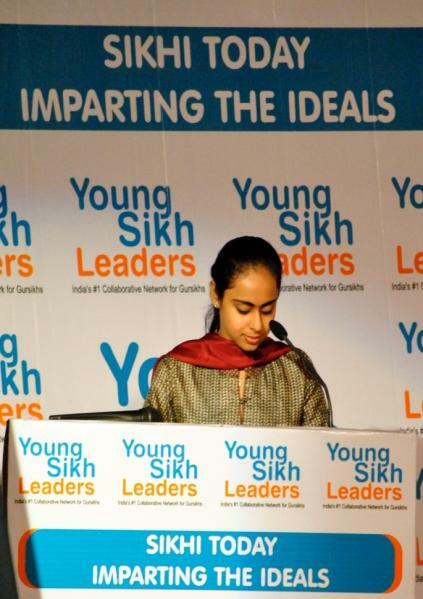 The talk was titled “Sikhi Today: Imparting the Ideals” and was hosted by Young Sikh Leaders (YSL). The presentation contrasted the lifestyle of today’s Sikhs with examples from Sikh history and doctrine which established the ideals of Sikhi. The presentation highlighted shortcomings in the community which Harinder showed have mitigated many of the current problems Sikhs face today. Besides critique, the presentation also included practical ideas for instituting needed changes based on the leader-servant model. The next event on the tour was hosted by Dr. Balwant Singh Dhillon, from the Department of Guru Nanak Studies at Guru Nanak Dev University in Amritsar on 3 March. About 50 research students representing the departments of the humanities, history, social sciences and religious studies participated. Under the theme “Sikh Studies: Inspiration and Trends”, Harinder Singh built upon the Sikh idea of research and scholarship within Gurbani, exploring different motives of such endeavors. He cited examples from history to highlight the strong nexus between scholarship and activism within the Sikh tradition. Moving on to contemporary research studies, Singh decried the ways that the scope of Sikh and Punjab studies is being reduced to identity and textual concerns. He emphasized the need for scholarship that provides new frameworks for social transformation, the ethical necessity of adopting an activist stance and the need for scholars to close the gap between the abstract and the reality. Moving on to the capital city of Punjab, Harinder Singh gave two presentations in Chandigarh. The first presentation on 5 March was organized by the Nanakshahi Trust in collaboration with the Chandigarh Museum and Art Gallery, and was held in the Museum auditorium itself. “NGOs serve in the areas where the state governance fails to deliver. Organizations that lack understanding of the social dynamics soon become obsolete or die out. They fail to preserve the very core they exist to serve. Today’s lecture gave a very insightful perspective on how to run an effective organization while maintaining relevance,” noted Davinder Pal Singh, the trustee of Nanakshahi. The topic of the presentation was “Achieving Good Today: Exploding Potential around Us.” To show ways to go beyond the conventional models of management theories for running NGOs, Harinder Singh cited the case studies of Teach for America and the Panjab Digital Library. He discussed the ways that these two organizations have harnessed creative yet impactful qualitative and quantitative approaches to bridge the gap between assumption and reality. Singh stressed how important it was for NGOs to continue developing ways to work in tandem with government policies and corporations, and adapt within the context of the present social-cultural and political realities. About 60 individuals representing different organizations working in the social field attended this event. The second presentation in Chandigarh was an iteration of “Sikhi Today: Imparting the Ideals," and was added to the schedule on short notice after a request from members of the Institute of Sikh Studies, Kendri Sri Guru Singh Sabha, and International Sikh Confederation. The talk was held on 7 March at the multi-purpose hall of Guru Gobind Singh College, Sector 26. Adapting the message for an elderly audience of nearly 50 individuals, chiefly constituting the members and organizers of local Sikh bodies, Harinder Singh contextualized the Sikh inspiration for today and stressed avoiding a pedantic approach when reinvigorating youth with the original freshness of Sikhi. “Remembrance and Identification: Becoming the Force” was chosen as the topic for the last event, held at Bhai Vir Singh Sahitya Sadan on 10 March. 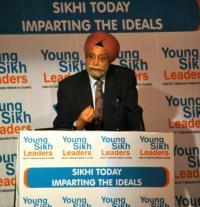 The presentation was organized by Maj. Gen Joginder Singh of Bhai Vir Singh Sahitya Sadan. Harinder Singh discussed 'Nam' as the basis for the ideology of Guru Nanak Sahib’s house. Through pointers from Gurbani, he delved into the vast dynamism hidden within 'Nam' and described it as a complete culture for the Sikhs to live in. Citing explanations from the likes of Bhai Vir Singh, Prof Puran Singh and Sirdar Kapur Singh, Harinder Singh challenged popular myths, surrounding 'Nam' and its remembrance. He countered formulae and technique-based approaches for connecting with the Divine and denounced current trends of passive definitions of Simran vis-à-vis yog, dhian, sadhana. Taking cues from Sikh history, Harinder Singh emphasized that 'Simran' is an indispensable part of activism that is based in love. SikhRI plans to do more educational events and provide avenues for networking among local groups to leverage each other’s expertise and resources towards community development via education.